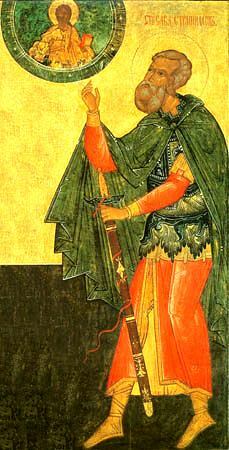 The Martyr Sava came from a Gothic tribe. For his bravery he attained the high rank of military-commander or "stratilates", and he served under the Roman emperor Aurelian (270-275). From the time of his youth Sava was a Christian and he fervently followed the commands of Christ, – he helped the needy and visited Christians locked up in prison. For his pure and virtuous life the saint received from the Lord the gift of wonderworking and in the Name of Christ he healed the sick and cast out demons. When the emperor learned that Saint Sava was a Christian, he demanded that he apostacise. The martyr threw down his military sash and declared, that he would not forsake his faith. They beat him, burnt at him with torches, threw him in a cauldron with tar, but the martyr remained unharmed. Looking on at his torments, 70 Soldiers came to believe in Christ, who then were beheaded by the sword. Saint Sava they threw in prison. At midnight during the time of prayer, Christ appeared to the martyr and shone on him the Light of His Glory. The Saviour bid him not to fear, but rather stand firm. Encouraged, the Martyr Sava underwent new torture in the morning and was drownded in a river (+ 272).